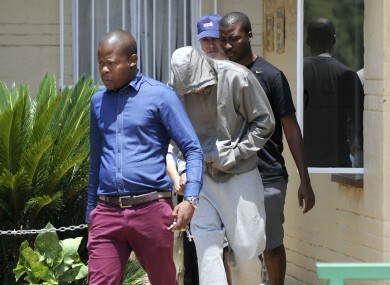 The 26-year-old athlete will appear in the Pretoria Magistrate’s Court in connection with the murder of his girlfriend Reeva Steenkamp. Paralympic Athlete Oscar Pistorius leaves the Boshkop Police Station ahead of a visit to hospital for medical examinations. OSCAR PISTORIUS IS to spend tonight in jail ahead of a court appearance tomorrow. The 26-year-old Olympic athlete is charged in connection with the murder of his girlfriend Reeva Steenkamp. eNews Channel Africa reports earlier indications that Pistorius would appear at Pretoria Magistrates Court this afternoon would not materialise. He had asked for a fast-tracked process so the initial hearing would take place today. The national hero is expected to bring a bail application forward, which will be opposed by South African police. Authorities have said the Paralympic champion will not be given special treatment during the investigation. Model Reeva Steencamp was found dead at Pistorius’s home in Silver Lakes, Pretoria in the early hours of this morning, reportedly shot four times in the upper body and head. Police have dismissed initial media coverage that the victim had been mistaken for a burglar. Spokesperson Denise Beuekes said investigating officers were “surprised” by the reports, which, she added “did not come from South Africa police”. Authorities have “no idea” where that version of events came from. Police have been forthcoming with information to the media this morning, confirming that there have been previous alleged incidents of a “domestic nature” at the home of Oscar Pistorius. Beukes said witnesses are being interviewed about “things that happened earlier in the evening”, as well as around the 4am shooting. “It would be premature and irresponsible to say what happened – we’re not sure,” concluded Beukes. Email “Oscar Pistorius to spend night in jail ”. Feedback on “Oscar Pistorius to spend night in jail ”.